If you love to craft than you know how quickly you can start to accumulate a large amount of craft supplies. This seems to be even more true if you have multiple crafting passions, because it just increases the amount of equipment you want to use regularly. The paradox, of course, is that you also need table space to work on your crafts. That is why a wall mounted organizer, such as this one, can be so helpful in your craft room, or other area of your home where you work on your crafts. You can store equipment and supplies in an easily accessible area, but out of the way, providing you more room to work, and taking advantage of otherwise wasted space. 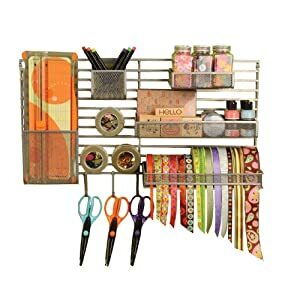 Although this product is shown as just organizing crafts, it actually can be used in many other areas of your home too, as a handy wall organizer, such as in your home office or kitchen, for example.